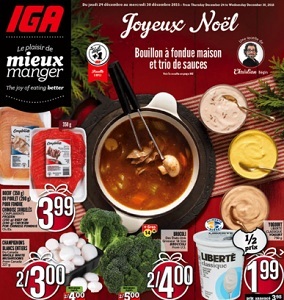 IGA Flyer December 24 – 30, 2015. Merry Christmas! IGA is a brand of grocery stores active in more than 30 countries which operates as a franchise through stores that are owned separately from the brand. 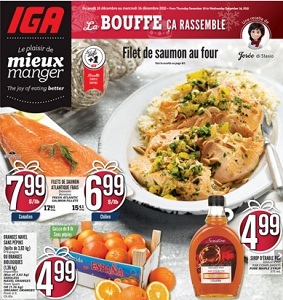 In Canada (apart from British Columbia), IGA is a group of independent grocers supplied by Sobeys, which franchises the name. Acquired by Sobeys as part of its purchase of the Oshawa Group Ltd., it now operates primarily in Quebec. In Ontario, Sobeys forced franchise owned IGA stores to convert to the Foodland banner, and announced the upcoming closure of the IGA program in Ontario. There are, however, many IGA stores still operating in Manitoba, Saskatchewan and Alberta. IGA Extra locations are larger and carry a wider variety of general merchandise, more akin to the hypermarket model. They include a pharmacy, large bakery, a bank, a bistro, a post office and a larger selection of food items. 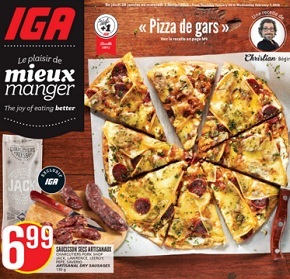 IGA Extra launched in the early 2000s take place of Sobeys locations in the Quebec City and Montreal areas. 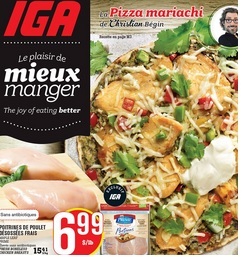 This week IGA flyer online. 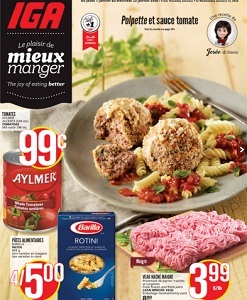 Best IGA weekly flyer, specials, sales, coupons, deals and offers in a single place.